The given tables show data on the consumption of beer and fruit juice in ten different countries. As is presented in the tables, Irish and German people consume the highest amount of beers per person while the Canadian and American people consume the highest amount of fruit juice per person per year. According to the first table, Irish people consume the highest amount of beer per person in a year amounting 155 litres while Finnish took 79 litres per year on an average. German and Australian citizens take more than 100 litres beer each year while they take about 34-38 litre fruit juices per person per year. People of Belgium and Denmark both take 98 litres beer while people of UK, Australia, US, Netherland consume less than 90 litres beer on an average. Finnish people take the least amount of beer on an average amounting 79 litres per person annually. 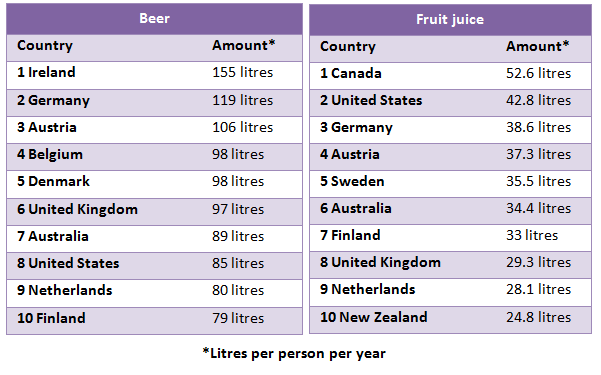 On the other hand, people of these given countries drink fruit juice less than half of the amount they drink the beers. Canadian people drink the largest amount of fruit juice contributing to 52.6 litres per person annually, while this amount is less than 50 litres for all other countries. New Zealand people consume the least amount of fruit juice each year on an average. In conclusion, people of the given countries drink more beer than fruit juices on an average. The table data compares beer and fruit juice consumption by ten different nationalities. Overall, people of the given countries consume more beer than fruit juice on average in a year. According to the first table, Irish people consume the highest amount of beer, 155 liters per person in a year. Second and third highest beer consuming countries are Germany and Austria with 119 and 106 liters/person per year respectively. People from Belgium, Denmark and Britain consume 97-98 liters of beer per year. Citizens of Australia, United States and Netherlands drink 80-89 liters. Lowest beer intake is in Finland with 78 liters average consumption. As per the second table, fruit juice consumption is observed to be highest in Canada with 52.6 liters, which is still far less than the beer consumption in this country. Germans and Austrians consume almost 38 liters of fruit juice per year. People in Sweden, Australia and Finland consume 35.5, 34.4 and 33 liters of juice respectfully. Fruit juice consumption is lowest in New Zealand, only 24.8 liters per person in a year. Precisely, people consume beer more frequently than the fruit juice. Irish people consume more beer than other nationalities and Canadian people have more fruit juice than people in other countries. The provided table presents information about the litres of beer and fruit juice that each person consumed per year in 10 different countries. As is presented as a census of a perusal, the first table depicts Irish and German drank the highest amount of beer with 155 and 119 liters consequently. Inhabitants who lived in Austria are placed in the third rank with 106 liters in terms of beer consumption. In other 7 countries, people consumed beer approximately similar to each other and these proportions oscillated between 79 and 98 liters per capita. Looking at the details in the second table it is clear that each Canadian drank 52.6 liters fruit juice per year in average. The United States’ people were the strong fans of fruit juice after Canadian inhabitant with 42.8 liters consumption and located upper than other regions. The fruit juice usage pattern in 8 various domains fluctuated between 24.8 and 38.6 liters per person. In summary, Irish and Canadian dwellers consumed the most amounts of beer and fruit juice among all spheres respectively and people who lived in Finland and new Zealand used the lowest quantity and were located at the bottom of the tables.